On the backdrop of US President Donald Trump's visit to the Western Wall, which took place with the traditional and customary gender separation, MK Yisrael Eichler (United Torah Judaism) said that this is an important message to the Reform community in the United States. 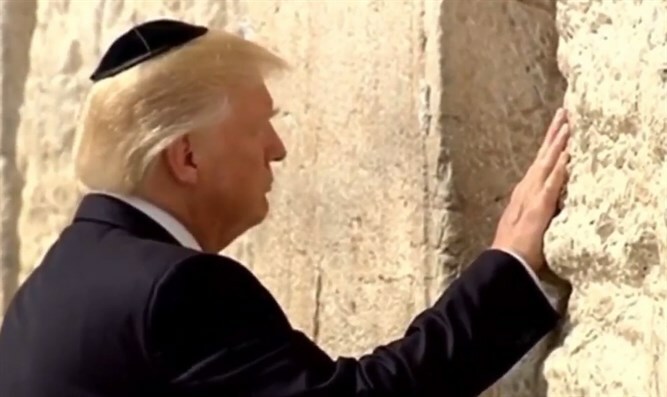 "Even if there is no political achievement in the president's visit to Israel, I am happy that the Reform [Movement] in America has had to see how the Trump family respects the Western Wall in complete separation - each in his place - prayers with men or with women, according to the custom of the holy place," Eichler said. He added that preserving the sanctity of the Western Wall is what distinguishes the holy site of the Jewish people. "The Wall desecrators and the High Court of Justice will not succeed in splitting the people and degrading the holy place of the Jewish nation in Israel and the Diaspora," he said. MK Yaakov Asher (United Torah Judaism) also said in a similar vein: "It is frustrating when the president of the United States and his wife respect the rules of the holy place for Jews, while the Reform and their helpers trample them underfoot." Interior Minister Aryeh Deri (Shas) congratulated Trump: "I appreciate and value the visit of President Trump and his family to the Western Wall. The visit honored the holy place of the Jewish people and was done according to tradition."